As spike in global deforestation fuels climate change, violence and failure to recognize forest peoples’ rights puts both people and planet at risk. CED’s vision is a society in which natural resource management (over forests, oil, mines, and land) ensures lasting social, economic and environmental sustainability. Its mission is to contribute to the protection of indigenous and local communities’ rights, interests, culture and aspirations in Central Africa, by promoting environmental justice and sustainable natural resource management throughout the region. CED has taken up the role of watchdog, scrutinizing all actors’ initiatives, processes, policies and practices, with an eye to their effectiveness in protecting forests’ essential functions and services, and in recognizing communities’ rights. Extending beyond this role, CED works to explore alternatives to dominant models, and defines its strategy according to three terms and conforming to an earth-friendly strategy: Mobilization (as a means of legitimizing our actions in the quest for sustainability), Resistance (to unsustainable methods of natural resource management) and Transformation (by finding solutions to reach sustainability). FECOFUN has become an effective mechanism for developing dialogue between policymakers and users and also a learning center for user groups on forest management. We believe the local communities and people are the real managers of the forests. We have learned from our past experiences that forests and people can live in harmony. FECOFUN is also a cofounder of the Global Alliance of Community Forestry, a network of community forestry users at the international level. Reduce poverty through specific, sustainable development projects and advisory services. Inform the Swiss public about its work and raise awareness concerning global injustice and the necessity to stand up for the needs of the world\’s poorest populations. Promote fair trade of products such as cocoa, rice and cotton from developing countries. Participate in global networks, petitions and as a member of Alliance Sud to take a public stance on development issues within Switzerland and internationally. IFRI’s goal is to carry out rigorous research that can help policy makers and forest users design and implement improved evidence-based forest policies. Most importantly, IFRI comprises partner collaborating research institutes in North America, Latin America, Asia, and Africa. As such, it draws on localized knowledge and perspectives in developing its research program. At the same time, IFRI utilizes an institutional analysis and development framework which promotes interdisciplinary research and analysis that enables comparability across regions. 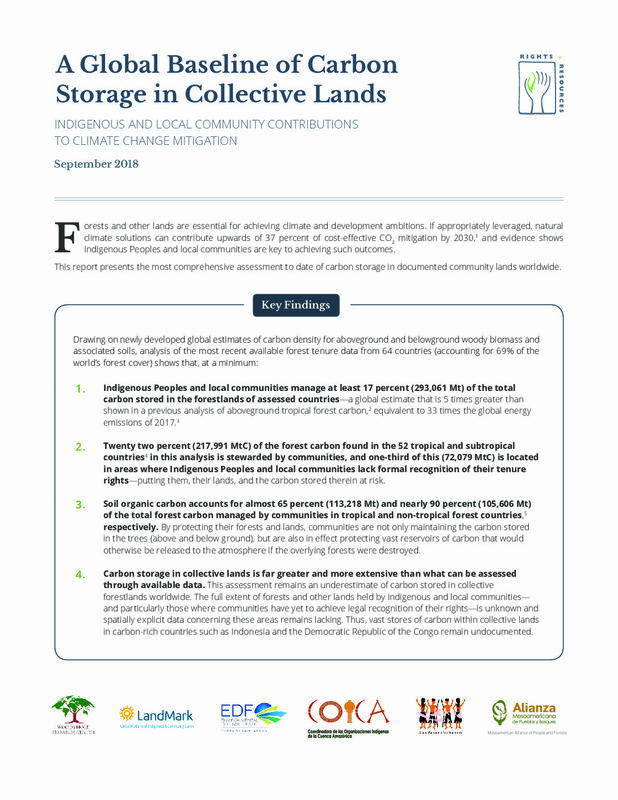 Specifically, some of the goals of IFRI’s work are to determine how to change processes leading to deforestation in many countries of the world; assess the nature of tradeoffs among forest conservation, livelihoods promotion, and carbon sequestration; and assess the role of institutions and policies in promoting better forest outcomes. The IFRI research program was initiated in 1992. It is currently housed at the School of Natural Resources and Environment at the University of Michigan, having moved from Indiana University in 2006. PRISMA (Salvadoran Research Program on Development and Environment) is a policy-oriented research center founded in El Salvador in 1993. Its mission is to work for the social and environmental revalorization of rural communities and territories as an integral aspect of development processes. PRISMA’s vision is societies that advance toward greater social justice and environmental sustainability. A shared concern by all participants for improving the livelihoods of poor marginalized communities and promoting sustainable development. A commitment to a genuine dialogue among different perspectives, focuses and points of view. Fomenting interaction among diverse actors (community-based organizations, NGOs, program officials, aid agencies, public functionaries, academicians), representing diverse sectors and disciplines, and engaged at a variety of levels (local, territorial, national, regional, global). The Samdhana approach is to have Fellows work closely with partners over time and during critical periods in program development. Samdhana fellows abide by Samdhana values and contribute to Samdhana programs that are geared towards nurturing individuals and community groups to develop new or enhance existing skills and benefit from the compounded knowledge of the Samdhana community. Tebtebba’s vision is a world where indigenous knowledge and indigenous peoples’ rights are respected and protected by all nations and societies; where there are unified yet diverse and vibrant indigenous peoples’ movements at the local and global levels which enhance the self-determination and sustainable development of indigenous peoples and their territories. The Asia Indigenous Peoples Pact (AIPP) is a regional organization founded in 1988 by Indigenous Peoples’ movements. AIPP is committed to the cause of promoting and defending Indigenous Peoples’ rights and human rights and articulating issues of relevance to Indigenous Peoples. The mission of AIPP is to strengthen the solidarity, cooperation and capacities of Indigenous Peoples in Asia to promote and protect their rights, cultures and identities, as well as their sustainable resource management systems for their development and self-determination. he AliansiMasyarakatAdat Nusantara (AMAN), or Indigenous Peoples Alliance of the Archipelago, is a national alliance of Indigenous Peoples from Indonesia. The organization was founded in April 2011, when 400 indigenous leaders from across the archipelago came together and agreed on a joint vision, mission, principles, and outlined the struggle and work program of Indigenous Peoples. At the global level, AMAN is also extremely active by advocating for the government of Indonesia’s adoption of the UN Declaration on the Rights of Indigenous Peoples, and by engaging with international financial institutions and networks of multinational firms that directly and indirectly affect the lives of Indigenous Peoples in Indonesia. to promote appropriate institutional design. The network aims to make concrete, meaningful, and effective contributions to forest governance in order to influence national policies and international frameworks regarding women’s rights and tenure in member countries. Under African customary law, women seldom own or inherit land, and the only way they can access it is by marriage or through their male children. Through advocacy work, REFACOF has been able to propose articles and forest policies to the government and to the parliament that include women’s interests and ultimately will secure women’s rights in forestry and natural resource management, as well as REDD+ in the coming years. The lack of collective action amongst women’s organizations was a pressing issue that led to REFACOF forming strategic country and regional level development interventions. By strengthening women’s networks and partnering with men so they can advocate for comprehensive gender equality, which benefits broad community wellbeing, REFACOF has made it clear that inequitable situations are not an option. 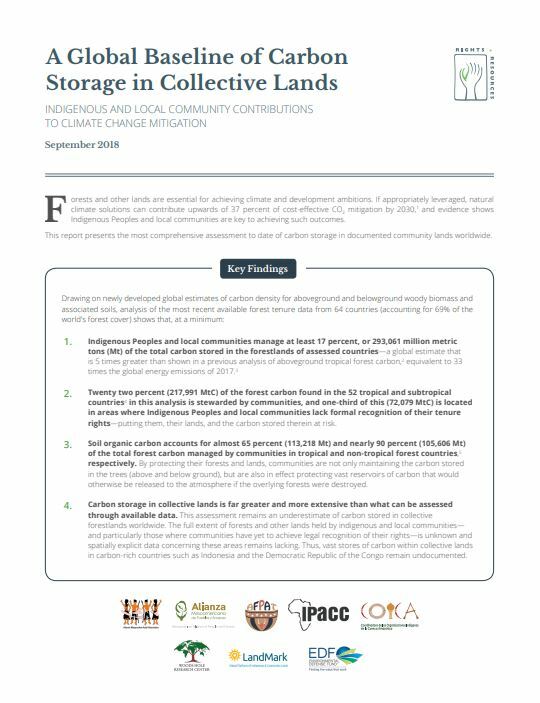 This report provides the most comprehensive assessment to date of carbon storage in documented community lands worldwide. 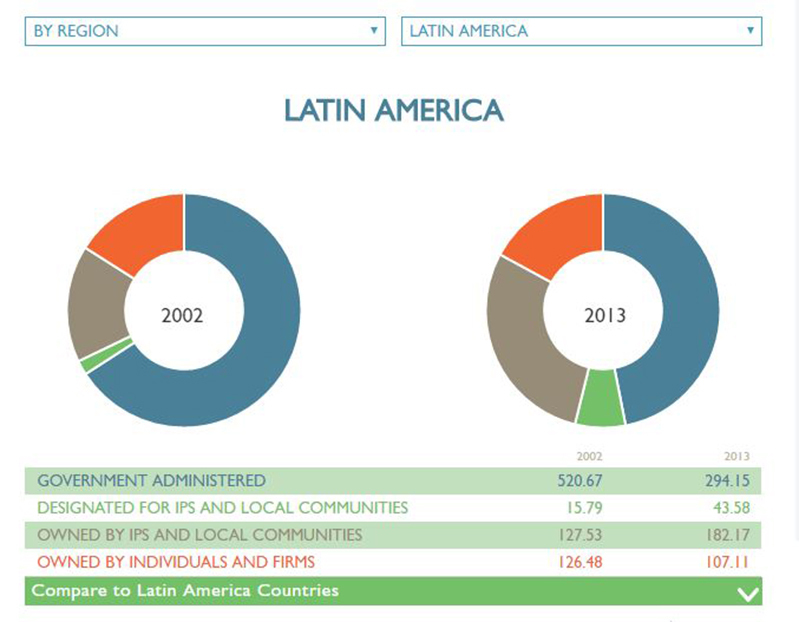 An interactive database for comparing changes in forest tenure from 2002 to 2013 in some of the world’s most highly-forested countries. A unique new institution that provides grants to advance land and forest tenure security and the rights and livelihoods of Indigenous Peoples and local communities. 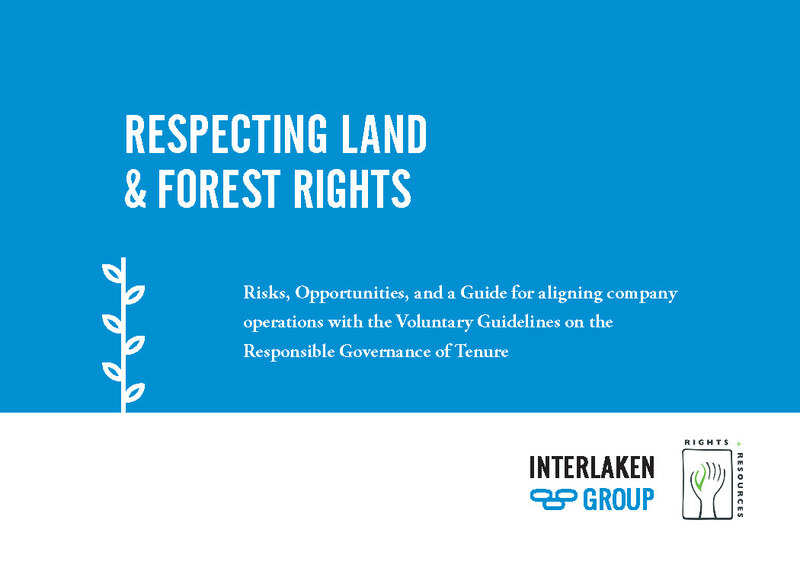 A network of diverse actors that creates, adopts, and disseminates tools and mechanisms to accelerate private sector learning on responsible land rights practices. 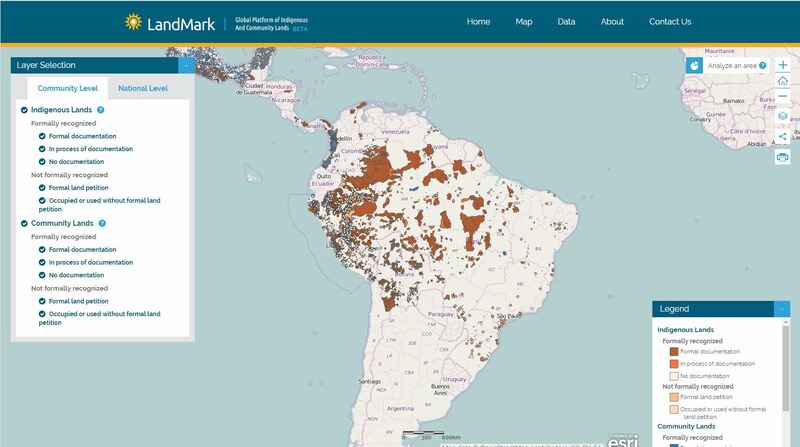 The first online, interactive global platform providing maps and other information on collective lands to address the lack of public and reliable tenure data. Join our mailing list for the latest news, events, and publications from RRI. Which language would you like to receive emails in? The RRI is a global network advocating for the land and forest rights of Indigenous peoples and local communities. As the RRI’s coordinator, Andy White travels the world, meeting with Indigenous and community leaders, governments and civil society organizations to discuss how local communities’ rights to the forest can be advanced. Here, as part of an ongoing review of community rights to forested lands and key conditions for success led by Tropenbos International, he talks about recent progress and challenges and the role that civil society organizations can play to help people claim their rights as a step toward locally-led sustainable development.